There are quite a few card games available at online casinos for UK players. One of the popular games, apart from blackjack, is baccarat. The game rules may seem a little complex but the game itself is easy to play. You can wager either on the bank or the player. The hand with the higher value wins and you win if you bet on it; otherwise the bank wins. There is also a third option that can happen in baccarat: a tie. Familiarize yourself with the game and the wagers and the way it all plays out. Experience the ambience and feel of the online casino without spending any money. Check out the pay tables and other subtler nuances of the game. Baccarat is considered one of the most exclusive and prestigious card games from all the casino games found on a casino floor. There are several reasons why the game of Baccarat is so well received, but the main reason is that it has always been seen as a game with a rich European history and a grand reputation, making it worthy of special attention, and in some cases, a roped off area on most casino floors. Therefore, players can’t be blamed for believing baccarat is a complex game to understand, and yet, the game of baccarat is probably the easiest game to learn in any casino setting, land-based or online. In this article, we will cover the rich history of baccarat and its evolution since its inception, take a look at the terminology, game rules, how to play, different betting types, and offer various tips and strategies along with interesting facts and frequently asked questions surrounding the game of baccarat. Players are likely to win 44.61% of the time. The bank is likely to win 45.84% of the time. The tie situation is rare and likely to happen 9.54% of the time. The game is thought to have evolved from 2 European games, Chemin de Fer and Punto Banco. There is one simple but major difference: baccarat is strictly a game of chance. Whether you win or lose depends on the hand value the player or the banker – whoever you have bet on – has. In Chemin de Fer and also Punto Banco it is slightly different in that there is an element of skill involved. The true origin of modern-day baccarat is most probably lost to history. The first-time baccarat was mentioned in written form by a contemporary observer was during the early 19th century. The written print, documenting the origin and evolution of baccarat, is unfortunately incomplete. However, a closer look at the written material revealed some intriguing facts surrounding the rich history of baccarat. Today, the game of Baccarat is considered one of the most popular games found in American casinos, and the undisputed leader in both floor space and revenue in Macau casinos. Baccarat’s history, however, is not well-known and might be unknowable, since there is little evidence of its earliest years. But, examining the existing historical material will still be able to shed a great deal of light on the history and evolution of the game. There are several authors who have guessed the source of baccarat, but these remain guesses and hearsay until a pre-19th-century document was discovered describing the game of baccarat. There are also several plausible origin scenarios. The game of baccarat might have partially derived from earlier games such as Pai Gow, a Chinese game that is played with tiles instead of cards. Pai Gow loosely translates to ‘making nine.’ Baccarat may have also derived from an ancient Roman ritual where a vestal virgin had to cast a nine-sided die to determine her fate. If she managed to roll a 9 or 8, she would become a high priestess, if she rolled a 7 or 6, her vestal virgin status would have been revoked, and rolling anything lower required her to drown by walking into the sea. Baccarat is a fixed number card game and may have taken the number 9 from both these unusual sources. As baccarat is played with cards, it forces us also to examine the source of cards themselves. Prior to the development of the printing press in 1440, playing cards were created by either carving or hand painting wooden blocks that were used to stamp paper. The technology surrounding block printed cards, including Pai Gow tiles, arrived in Italy after Marco Polo returned from his expeditions in China during the 1290’s. Italy seems to be the likely source of baccarat and appeared during the early 14th century. For playing cards to become common, they had to overcome the block printing and handcrafting of playing cards, as these methods were extremely expensive and very time consuming, limiting the availability of playing cards. Johannes Gutenberg provided a solution by inventing a movable printing press. This allowed playing cards to be brought to the masses and printed packs of 78 playing cards. This resulted in more people playing card games, and it was here where modern Baccarat was born and nurtured. During the 15th century, Felix Falguiere invented baccarat in its modern form by using Tarot cards. There was also another popular Italian card game called Macao that is often referred to as Italian baccarat. Macao is a card game that is played to the total of nine and has a much longer history than baccarat. It is very possible that the game of baccarat derived from Macao. The game of Le Her is also a possible relative to the game of baccarat. In Le Her, two players are dealt a single card, and the cards range from 1 to 13, with King being the highest ranked card and Ace being the lowest. The player receiving the first card had the option to exchange his card with the second player. If an exchange was made, the second player had to draw a new card and drawing a king automatically made you a winner. The first publication of Le Her was made in 1713. Therefore, Le Her can also be seen as the ancestor of baccarat. Baccarat is also known around the world as a French game, and the first mention of the game was made by Charles Van-Tenac. In 1847, he published a book called Album Des Jeux featuring a 13-page mathematical analysis surrounding the game of baccarat. As the legend goes, the game of Baccarat was introduced to France by soldiers returning from the Italian conflicts that were instigated by King Charles VIII in the 1490’s. The game of baccarat then quickly grew in popularity with the French nobility. There are also stories of baccarat being played during Napoleon’s time, and two forms of the game were fashioned. One was a banking game known as Baccarat en Banque and the other a non-banking version known as Chemin de Fer. These two forms of baccarat were extremely popular across Europe but held the greatest sway over France until 1837 when casinos were made illegal during King Louis Phillip’s reign. Both forms of baccarat survived in clubs that operated outside the law, and it remained quite popular throughout Western Europe. Chemin de Fer means railway or iron way and the name was adopted in 1832 from the action of the shoe that moved around the table to different players. This is also known as the most elegant version of baccarat. The first description of Baccarat en Banque was in 1911 where it was simply called baccarat in the Hoyle books. The name confusion between the two forms of baccarat only began after players started calling baccarat, Punto Banco. However, there is evidence suggesting that the game was there even earlier; in the year 1490 Italian baccarat was brought to the courts of France. In today’s time, it reached the casinos of Las Vegas in 1959. With the arrival of the online casino the game quickly made the transition to the online version of the casino and has been offered at most of the online casinos. This is a game that is a favorite of the high rollers, as shown by depictions in the James Bond movies. The two slots for dealing the cards: one for the dealer and another for the player. The chips you need to click to place your bets; these are at the bottom right of the screen. The Rebet button to place the same bet as the last hand again. The dealer’s shoe at the top right of the screen. Many respectable authors who have undertaken the subject of baccarat believed the game arrived in America around 1911. According to John Scarne, Chemin de Fer was enjoyed in illegal casinos all across the eastern United States during the early 1900’s. John Scarne mentions that Chemin de Fer was played in New York during 1911, but it could not compete with other banking games such as Blackjack and Craps. A surprising fact about baccarat is that it was completely absent from the 1931 Nevada Assembly Bill legalizing casino gambling. The Nevada State Legislature legalised draw poker, stud poker, craps, klondyke, big injun, seven-and-a-half, blackjack, fan-tan, keno, roulette, monte, and faro. Chemin de Fer was the first version to be played in Nevada casinos when a table was opened in 1958 in the Sands. Chemin de Fer is known as a non-banking game with the house collecting a rake of the winning bets, much like modern poker. The modern-day form of baccarat, as seen in today’s casinos, first started out as Punto Banco and was initially developed at the Mar del Plata Casino in Argentina around 1955. Several Cuban casinos introduced the game in their establishments during the 1950’s, and this is where Tommy Renzoni discovered the game. In 1959, he changed the world of baccarat forever when he brought this new version to Las Vegas. Punto Banco is essentially the modern-day version of baccarat we know today and is the banking version of Chemin de Fer and Baccarat en Banque. The baccarat table found in casinos today was not identical to the baccarat game introduced by Renzoni. There were quite a few interesting differences with the early modern baccarat games during the 1960’s. The first version included a side bet on naturals that has since been replaced by the Tie wager, and the games used cash instead of chips. In 1970, most Las Vegas baccarat tables replaced the cash with chips. During the 1960’s and 1970’s players could sometimes shuffle the cards where it would be reshuffled by the dealer afterward. During the 1970’s there was a total of 15 baccarat tables in all of Las Vegas. Since then, baccarat has become extremely famous, and you can now even find mini-baccarat games as well. In 2008, the Nevada Gaming Control Board approved 24 different baccarat variations. Online baccarat has a seemingly complicated set of rules but is easy to play. The following are the steps outlining the way the game is played. Pick the UK online casino that you want to play baccarat in. Sign up and deposit funds into your casino account. Go to the Games tab and click Baccarat. You have the option of placing bets on all the 3 entities. In that case you lose out the wager placed on the 2 other hands that lost; the winning amount is credited to your account. Click the chip of the value for the amount you want to wager. The player and the dealer are dealt two cards each. Depending on the hand value a third card may be dealt to one or both of them. The hand with the higher value wins. You can click the Rebet button to repeat the bet you bet in your last hand or place fresh bets again. In this section, we will cover all the basic terminology involved in the game of baccarat. Most of the words derive from French or Italian where the origins of baccarat developed. Even after baccarat has been available in the United States for decades, it still uses the same terminology. Baccarat: The name baccarat translates to zero. When either the banker or the player hand has a total of zero, it is referred to as baccarat. Banker: This is one of three possible bets available on a standard baccarat table. It will pay 1 to 1 minus the banker’s commission of 5%. The house edge of baccarat is just over 1%. Bankroll: This is the amount of money you have to gamble. Chemin de Fer: This is a version of baccarat that is quite rare in today’s casinos. It is only available in a couple of European casinos and to high limit players. Coup: A round of play that comprises of a banker hand and a player hand. Dealer: The person who is in charge of drawing cards. 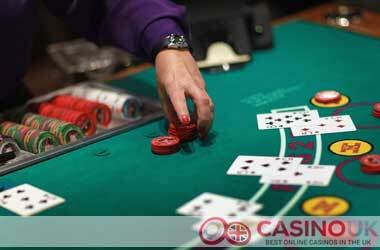 The dealer position can be taken by players when playing at a big table version of baccarat. Dealing Shoe: This is a container from where the cards are being dealt. Dragon Bonus: This is a side bet option for either the banker or player hand. It will pay when your hand wins by a large margin or when your hand is a natural winner. 30 to 1 is the highest payout that is won by nine points. Game Supervisor: This is a casino employee that ensures the correct rules are followed at all times. 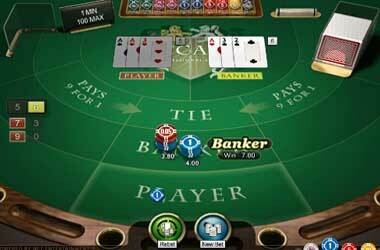 Mini Baccarat: This is a popular version of baccarat where the dealer deals all the cards. These tables tend to be on the main casino floor and offers lower table limits. Natural: This is a hand count of nine or eight from the first two initial cards dealt. Player: This is one of three possible baccarat bets and pays 1 to 1 with a house edge of just over 1%. Player bet is the opposite bet to Banker bet. Punto Banco: This directly translates to “player banker” and is the most popular version of baccarat in land-based casinos and online. Run: This is a side bet that offers the opportunity to wager on a series of hands. For instance, you can wager on five banker hands in a row. Table of Play: This is a set of rules dictating when and if a 3rd card can be dealt to either hand. Tie: This is one of three possible baccarat bets and pays 9 to 1 with a house edge of just under 15%. The rules of baccarat are quite simple. You can place a bet on the banker or a player. You also have the option of betting on a tie. Two cards are dealt out to each playing entity, starting with the player. The value of the Ace is 1. The value of the cards from 2 to 9 are at face value. The value of cards from 10 to King is 0. The value of the hand is determined by adding the values of the 2 cards in the deal. If the value of the hand exceeds 9 the right hand digit’s value becomes the hand value. So if the 2 cards add up to 10 the value of the hand becomes 0. A third card may also be dealt. This is dependent on certain specific rules that we list below for you. The bank and player both stand if either of them has a total value of 8 r 9. This is the primary rule influencing the third card deal and has more weightage than the other two rules listed below. The player hits if he has a hand value of 5 or lower. Otherwise the player will stand. If the player is standing the bank will hit if his deal yields a value of 5 or lower. If the player hits the bank will hit or stand depending on the situation. The banker hits if he has a hand value between 0 and 4 and stands if he has a value between 5 and 7 if the player draws a card of value 2 or 3. The banker hits if has a hand value between 0 and 5 and stands if his hand value is 6 or 7 if the player draws a card of value between 0 and 5. The banker hits if he has a hand value between 0 and 6 and stands if his hand value is 7 if the player draws a 6 or 7. The banker hits if he has a hand value between 0 and 2 and stands with a hand value between 3 and 7 if the player draws an 8. The banker hits if he has a hand value between 0 and 3 and stands with a hand value between 4 and 7 if the player draws an Ace, a face card, 10, or 9. Baccarat is a single play game, as you will only get to make one move per hand. In blackjack, for instance, you can make additional plays after the initial cards have been dealt. In the game of baccarat, you only need to decide on one of the three possible bets, including banker, player, or tie. Thereafter, the cards will be dealt in accordance with a pre-determined set of rules. The three versions of baccarat, including Baccarat Banque, Chemin de Fer, and Punto Banco, all feature slight rule variations. However, for this article, we will focus on the rules of Punto Banco, also referred to as American Baccarat, which is the most widespread variation of baccarat that you will find in land-based and online casinos. The aim of baccarat is to get a total of nine or a total closest to nine without going over. All kings, queens, jacks, and tens have a value of zero, whereas ace as a value of one and all remaining cards have their own face value. Any hand that displays a value over ten will have the ten disregarded. For example, if you have a hand that totals 12, it will only count as 2 in the game. The best possible hand in baccarat is a natural with a total value of nine or eight. The game will start with the dealer dealing out two cards to the player and another two cards to the banker. It’s worth mentioning that the player and the banker are two square boxes on the table and there will only be one player hand dealt, and one banker hand dealt, regardless of how many players are at the table. In most baccarat games, the player making the highest bet will receive the player hand, but this hand will be used for all other players as well. Once the cards have been dealt, the hands will be compared. If either the banker or the player has a hand totalling nine or eight, the hand will end, and the winning bets will be paid. Should the player have an eight and the banker has a nine, the banker will win. If neither the banker nor the player has a natural hand, then a third card will be drawn by the dealer. The draw is done in accordance to the rules and can’t be decided by the player. The player hand will always be drawn first along with the following rules: If the player hand total comes to 0, 1, 2, 3, 4, or 5, the player will need to draw an additional card. If the player hand is 6 or 7, the player will stand. The banker hand rules will be determined by the player hand and will be decided as follows: If the banker hand total is 3 and the player hand total is anything between 0 to 7, the banker will draw an additional card. If the banker hand total is 4 and the player hand is zero or anything between 2 to 7, the banker will draw an additional card, and if the banker hand total is 5 and the player hand total is 4, 5, 6, or 7, the banker will draw an additional card. Lastly, if the banker hand total is 6 and the player hand total is 6 or 7, the banker will draw an additional card. The winning bets are credited to your account while the money is deducted from your casino account and deposited with the banker if you lose. A winning wager on the player results in a 1:1 payout. A winning wager on the banker results in a 19:20 payout. A successful tie bet results in an 8:1 payout on the original wager. The tie bet is not something you may want to use because of the huge house edge for this bet: 14%. There’s a good reason why the game of baccarat is a favourite amongst high rollers. It offers the lowest house edge of any casino game and will make your money last much longer. Although there’s not much you can do to influence the outcomes of each hand; there’s still loads you can do to improve your odds in the long run. We will now have a look at a few tips and strategies to improve your gameplay while playing baccarat. It’s very clear while looking at the above odds, that you should avoid betting on a tie. It’s considered a sucker bet with a house edge of 14.36%. The only reason most players bet on Tie is because it pays 9 to 1. Although it might pay off big, you are more likely to lose your bankroll. Betting on the banker is statistically the best bet available in baccarat. Although there is a 5% banker commission, the odds are still in your favour as it provides the lowest house edge, giving you the best chance of winning in the short term. This might be contradicting advice after I initially recommended betting on the banker. However, there are a few situations where betting on the player will be the more optimal choice. For instance, a lot of players utilise progressive betting systems such as the Martingale system where you double your bet after every losing hand. The problem with using this type of system is the 5% banker commission. Let’s say you make four losing bets, and on your fifth bet, you win. Your first four bets include wagers of £25, £50, £100, and £200 and on your fifth bet, you wagered £400. You lost £375 on your first four bets and won £380 on your fifth bet. Then you need to deduct the £200 banker commission of 5%, leaving you with a £5 profit. If you decided to bet on the player, you would have had a profit of £25 as you didn’t have to pay the banker’s commission. In all honestly, betting systems don’t work, as all of them are flawed. Whether you decide to use the Fibonacci, Paroli, Labouchere, Contra D’Alembert, or Martingale system, none of them will guarantee a win. Some of them might have a limited value in managing your bankroll that that’s even questionable. So, if you are thinking of using a betting system, don’t. They are far more likely to do more harm than good. When Baccarat was first introduced in America at the Sands Casino in Las Vegas, they lost £195,160 in a single night across various tables. Instead of throwing out the game completely, the casino decided to make a few changes to the rules to bring the odds back in their favour. A billionaire known as Akio Kashiwagi lost quite a bit of money while playing baccarat. He normally gambled £100,000 to £200,000 on a single hand, over the course of several hours. He might have lost quite a bit, but he also managed to win. His biggest win was £6,000.000 back in the 90’s. He is known as ‘The Warrior’ and is considered the most famous Baccarat player in the world. During the late 90’s another huge win occurred at the Crown Casino in Melbourne, Australia. Over the course of several months, the Crown Casino lost £429,352,207 in baccarat games. The games were played by several high-rolling Asian gamblers with the biggest single win of £9.3 million. The largest win recorded to date on a baccarat game occurred in Macao during 2015 when Lin Haisan won just over £10 million at the World Series Baccarat Championship. The World Series of Baccarat Championship also broke the biggest tournament pot, paying out £11,7 million. Is it beneficial to play baccarat online? If you would like to give baccarat a go and want to play in a more relaxed environment, then playing online will be your best choice. You firstly won’t have to adhere to the etiquette of land-based casino baccarat and playing online will also allow you to make smaller wagers on every hand. This is ideal for beginners just starting out on baccarat, ensuring their bankroll lasts longer. Are the outcomes of baccarat random? Yes, they certainly are. Most players like to keep track of the previous hands played and their values to successfully determine the betting decisions for the next hand, or hands. However, this is superstitious in nature as each hand is independent of the previous hands played. Counting cards are also out of the question while playing baccarat, as players don’t make the same decisions as opposed to playing blackjack. How does other table games compare to baccarat? While the house edge in baccarat is a generous 1.06% when placing a banker bet, blackjack still offers the best odds for any player with a 0.26% house edge, if the rules are optimal. There aren’t other competitors with baccarat after blackjack, and due to the limited amount of errors and the simplicity of the game, this is extremely appealing. The best house edge is 1.36% in Craps and 2.7% in roulette, making baccarat a great choice when compared to other table games.